Cup football took over the midweek action in the Central Midlands League with seven second round ties in the Buckingham Insurance League Cup. 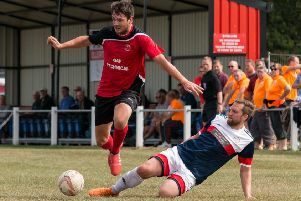 Biggest winners on Tuesday were Sherwood Colliery who had a short journey to Southwell City and were too strong for the South Division bottom markers, winning 6-2. A first half hat-trick from Liam Black and one for Yogi Depass, which were countered by a well struck Stewart Gill free kick, gave the Wood a healthy interval lead. Keyworth United also defeated North Division opponents in Newark Town, the margin here 4-0. Harry Simpson gave the home side a fourth minute lead, which was extended by second half goals from Goran Seymour (2) and Elliott Roulstone. Wednesday night’s three ties saw two more northern teams fall to opposition from the south. Appleby Frodingham continued their winning run as they overcame Dinnington Town 7-2 at Brumby Hall. Dayle Hutson and Joe Moloney’s goals first half goals for Frod saw them 2-1 up at the interval, Kyle Wesley pulling one back for the visitors, but the second period belonged to the home side, with Matthew Oates getting two and Hutson, Paul Tait and Steve McCarron all on the scoresheet, Nicky Holland with Dinnington’s second. Belper United also ran in seven against basement side Welbeck Welfare. There were hat-tricks for Sam Vickers and Ashley Dhindsa, Lewis Mundin also scoring, while Welbeck grabbed a consolation effort through Bogdan Jora.